Want to Receive Fisheries Magazine Every Month for Free?! Become a member of the Society! The Society needs your support. Won’t you join us today? Click to learn more! click here and sign in, then on the green, right hand menu you will see members only > members only links! Not a member yet? Click here and learn the benefits of joining the American Fisheries Society (AFS)—the world’s oldest and largest organization dedicated to strengthening the fisheries profession, advancing fisheries science, and conserving fisheries resources. 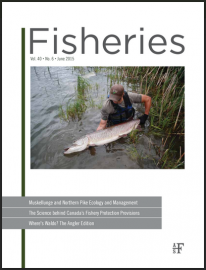 • Receive Fisheries magazine each month. • Enjoy special savings on subscriptions to AFS published books. • Enjoy special savings on meeting registration. Next story US Army Corps of Engineers habitat restoration project needs your help! Fish Habitat Section of the American Fisheries Society © 2019. All Rights Reserved.